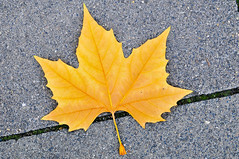 A Golden Leaf | W. Wayne B.
I watched a golden leaf flutter down. The branches whisper in the breeze. Each leaf that falls cleanses the tree. It is preparing for winter and a chance to sleep. The words I speak have a pure energy. My actions have motion and meaning. I can remember the past as a guidebook. It gives me direction for today. I imagine that I can survive unchanged. I’ve been full of conflict. I am tense and full of fear. I will begin to simplify my life soon. My problems present me with difficult decisions. I breathe slowly and let the days go by. I am waiting for the winter snow. I will be stronger when spring returns. This entry was posted in Poetry and tagged decisions, gold, leaf, snow, winter, z1698. Bookmark the permalink.